The 2014 vintage, despite being one of the most complex to manage in recent years, gave way to very pleasant surprises as a result of favorable end of season conditions, which gave us high quality in the vinified grapes. The spring, following a mild winter, came rather gently but prematurely. The amount of rainfall in the summer was above average, with real “cloud bursts” on a few occasions, quite contained yet intense. Particularly significant were the rains on the 23rd and the 29th of July, which however had profoundly different outcomes; in some areas 63 mm of rain were recorded in a single day, while just 15 km away only 13 mm. The month of September was undoubtedly positive from a climate point of view, with good diurnal temperature shifts, significantly contributing to grape quality and phenolic maturation. Nebbiolo is the varietal that responded best to the beautiful climatic conditions at the end of the maturation period. Thanks to our diligent thinning and cleaning of the bunches during the vegetative cycle, excellent results were achieved. Harvesting operations began on October 10 and lasted until October 18. ALESTE is the natural continuity of Luciano’s first wine, the Barolo Cannubi Boschis. 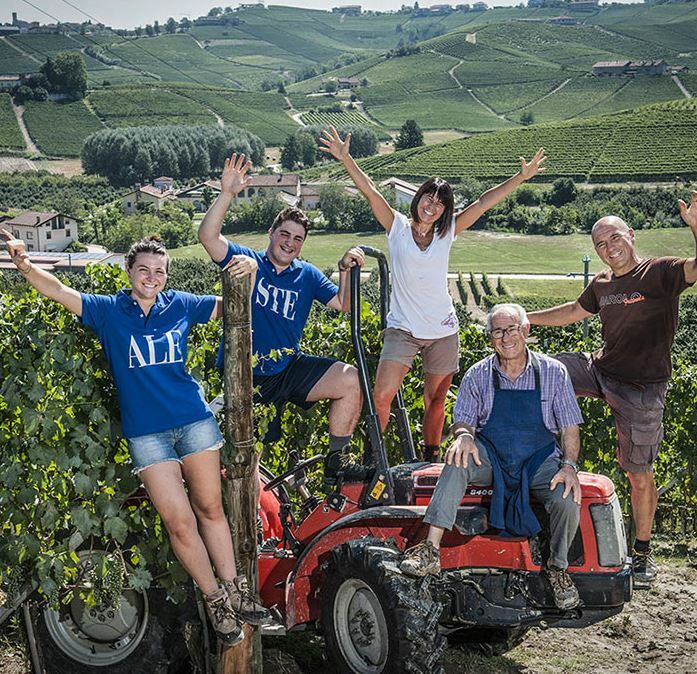 Giving all the experience, knowledge, patience and passion of his many harvests, Luciano pays tribute, with boldness and sensibility, to the next family generation: “ALESTE” is in fact the combination of the names of his grandchildren ALEssia and STEfano. From the very first bottling in 1985, Luciano always believed in the unique and distinctive potential of the Cannubi hill, and that he wanted to express this potential by way of a separate vinification. This bottling pays homage to the richness and elegance of the favored Cannubi site in the heart of the Barolo. The optimal soil and climate conditions, harvest after harvest, have brought forth a wine that has drawn international attention since its first release. Sandrone ALESTE 2014 is a wine of elegant personality, ageable and able to transform and transmit over the years of maturation the nobility of its character, origin and style. In the glass, the color is beautiful and brilliant garnet red. The fragrance, rich and complex, begins with floral notes – iris, aromatic herbs and dried hay – then raspberry and wild strawberry, finally ethereal spice notes of cinnamon and green peppercorns as well as tobacco. The flavor is rich and precise, enveloping and warm, with notes that recall the aromas of spice and jams, herbs and tobacco. It is a dense, structured and long-lived wine, yet one of elegant character; the acidity and tannin give balance to the wine, and the finish is velvety. Le Vigne Barolo interprets the ancient handed-down wisdom and tradition in Langhe and Barolo of assembling the Nebbiolo grapes from various vineyards. We interpret this historic practice by working only with indigenous yeasts and by keeping the grapes of each vineyard separate during the fermentation and barrel aging, rather than combining them during fermentation. We meticulously selected four vineyards so as to bring out all the characteristics of the Barolo area. The vineyards of Baudana in Serralunga d’Alba, Villero in Castiglione Falletto, Vignane in Barolo and Merli in Novello form a perfect diagonal across the area which encompasses different terrains: light and sandy, more compact and deep, and all at different altitudes and exposures. Harvested, vinified and aged separately, only the best lots are mixed together during the assemblage so as to express the uniqueness of the vineyards and enhance the particularities of each vintage. The Sandrone Barolo Le Vigne 2014 surprises with its intense garnet color, alive and beautiful. As it ages, it will slowly fade in intensity and gain subtle orange-brick hues. The scent, broad and persistent, first shows fruit notes of wild strawberry and raspberry, then floral notes including wild flowers and dried roses. Spice aromas of cinnamon and star anise emerge at the finish. With time we expect secondary and tertiary aromas and flavors to evolve, such as elegant vanilla notes and then dried mushrooms, leather and truffles. The flavor is rich and intense, with youthful expressiveness in the tannin and acidity. Time will bring greater harmony, resulting in a more complex and balanced wine. It is a young, solid and promising Barolo, born of an ancient process which combines knowledge of the territory with the ability of the various characteristics of each vineyard site to meld into a harmonious whole. The Valmaggiore vineyard in the Roero hills, on the left bank of the Tanaro river, is one of the best historic sources of origin and quality. Already in the Nineteenth Century, the Nebbiolo grapes grown in this vineyard were so highly regarded that they dictated the price for the entire territory. In the 1990s, the first sight of Valmaggiore was like a bolt of lightning for Luciano, Luca and Barbara: they fell in love at first sight. This was not only for the history and the long viticultural tradition, but also for the particular uniqueness of those sandy soils combined with the microclimate. Our Valmaggiore is an amphitheater facing the south, with full exposure to the sun. Here, nature is rich and vigorous. The ground is soft and sandy, the slopes extremely steep. Already in the planting of the vineyard, the respect for nature and tradition was strategic. This respect is present every day: we cultivate by hand, row by row, from bud break to when we harvest the ripest grapes; we make our vineyard a laboratory for healthy and well-cultivated fruit. In Roero, a significant historic agricultural richness has been preserved, and not only in viticulture. Here, Nebbiolo is distinguished for its finesse and elegance and we, like those in the past who were also proud and convinced, wish that our Valmaggiore wine expresses all the grace and refinement of Nebbiolo. 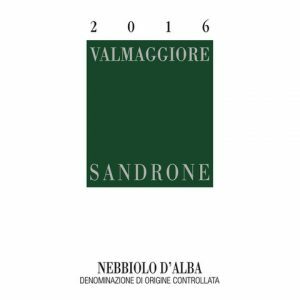 Nebbiolo d’Alba Valmaggiore 2016 is a noble wine, exemplified by its natural elegance and complex character. It has a ruby color that shows the first garnet reflections. The aromas are full and complex. Fragrant notes recall iris and aromatic herbs, then wild strawberry, pomegranate and candied raspberry. This is followed by evolved, complex fruit stucture with red fruit jam and dried apricot, followed by spicy notes of cinnamon and vanilla. The taste is dry, elegant, warm and persistent. The alcoholic structure and acidity hamonize successfully and show finesse in their character. The wine will improve with proper cellaring, growing into its aristocratic heritage: complete, authoritative and harmonious.